So, you finally purchased a droid based phone! Congratulations! You just moved to the world of portable personal computing! You will be able to do things on your phone, that you weren’t able to do on your computer 10 years ago! But, with great power, comes great viruses. Should you worry? Not really. Yes, since Google has an open marketplace, potentially anyone can put any app on there. Well, sure, an app can go on the marketplace, but surely not viruses right? Well, A computer virus is a program (or app!) that is secretly introduced into a system in order to corrupt it or destroy data. Often viruses are hidden in other programs or documents and when opened, the virus is let loose. * Ok, so we now know that a virus can be any program, and that its malicious in nature. What does that mean for me and my new phone?? Well, first of all, when you install a program on the market, it tells you exactly what it will do before you install it. 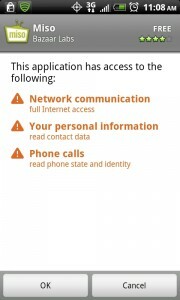 File Permissions, Pay attention to this! 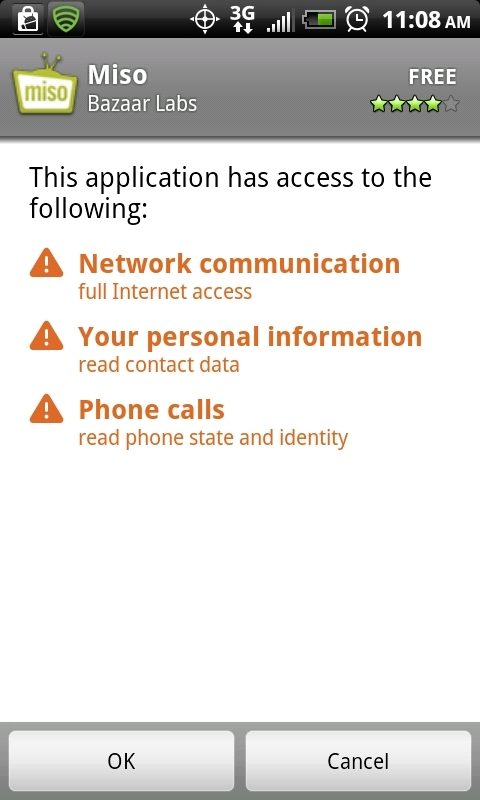 As you can see above, it will access the internet, look at your contacts, and check your phone state. Now, this program is a social network for television programs, so that all makes sense. 1. Access to the net is obvious because it needs data. This one will be common. 2. Your contacts is also obvious because its a social network program, so it will want to send out info to your friends. 3. This one is sneakier, because you think why would the program need access to my phone? Is it going to call someone? Well no, it needs to know if a call is being made, so that if you’re using the program and get a phone call, it will know to save what your doing and let you take the call. So, as you can see, this is very important when downloading programs from the market. If you have a program that gives you sports stats, but in the permissions it says that it will send text messages, or have access to something else that doesnt make sense, think it through, and read the comments. Well, I don’t want to pay attention to every program I install on my phone, is there an alternative? Yep, there is! Its why I created this post in the first place! its a great program called Lookout (at the time of this post, it is free, and will be free for the life of that person if they get it now. In the future it will cost, and if you get it later, then you will have to pay!) . Sweet! So an antivirus program for my phone? Awesome! Lookout is constantly checking the programs you have installed on your phone, and against it’s database of malicious programs, and will alert you if you try to install a bad program. This gives you peace of mind. I especially like it because I install programs that are NOT in the marketplace, and have a higher likelihood of being malicious. 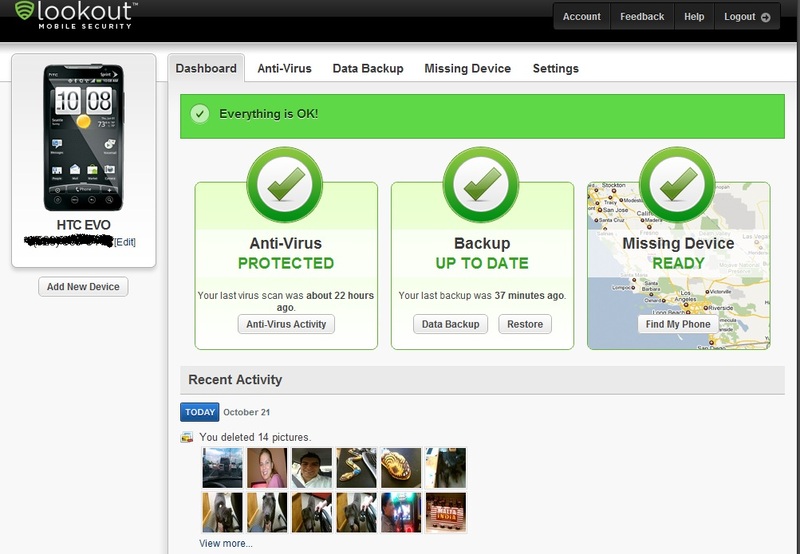 If it was only an antivirus program, then great, but Lookout does 2 more things. It also backs up your phone, and provides you remote location monitoring. Ok, what does that mean? To completely restore your phone, click on databackup, then Start Restore. 2. Remote Location Monitoring: So, your phone was lost/stolen. What do you do? Go to mylookout.com, and click on missing device. You have 2 options. the first is to locate your phone. It takes about 30 seconds. Now the caveat to this is that if you turn off your GPS (which I do) it will only give you the approximate location using cell tower triangulation, Which is nice, but I wish there was a way to remotely turn on the GPS so you would have a more accurate location. 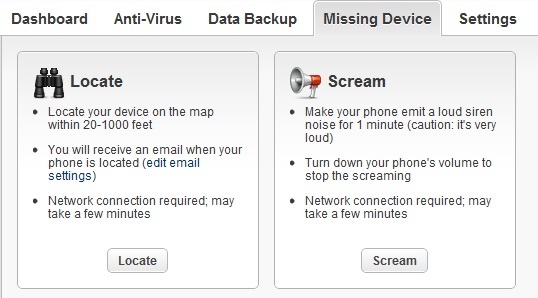 The second option is to make the phone Scream! 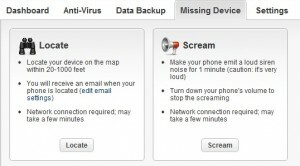 This is quite hilarious, but it makes it much easier to find your phone if its lost at home somewhere. ← Political Ads – You stab me, I stab you!